“Land Warrior was a great start and we learned tremendous lessons from that, but we also know we have to get better. 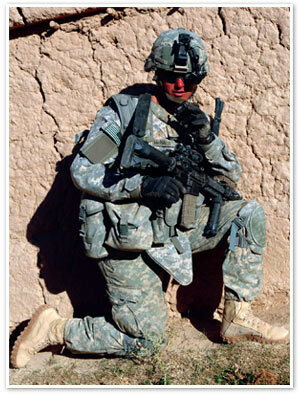 That is what we are trying to do as we go forward with the Ground Soldier System (GSS),” explained Colonel Will Riggins Project Manager, Soldier Warrior, Program Executive Office (PEO) Soldier. The GSS programme awarded three Technology Development contracts in April last year, directing General Dynamics C4 Systems, Raytheon and Rockwell Collins led teams to focus their efforts on the areas of worn displays and computers, user input devices, navigation, antennas and cables with the balance of other equipment and software being provided as Government Furnished Property. The teams are now preparing for a Limited User Test planned for later this year, in preparation for a Milestone C decision scheduled for the second quarter of FY2011 and an Initial Operational Capability due in late FY2012. Neither Land Warrior nor GSS exists within a conceptual vacuum. The structure being used by PEO Soldier to guide its approach to soldier modernisation is known as Soldier as a System (SaaS). “We are just starting to get around what ‘Soldier as a System’ means,” explained Col. Riggins. “That has a set of far reaching implications.” He sees this as being based on an understanding of the commonalities and differences between soldiers, based on their mission sets, roles that they fulfil and their leadership level. All the information in the world and all the capability in the world is only as good as the soldier being willing to carry it. A significant portion of the weight carried lies in the supply of power.